Many a family has been shattered during the journey of a loved one’s death. Some of the hurt will never go away, but parts of the journey can be made much easier to bear. 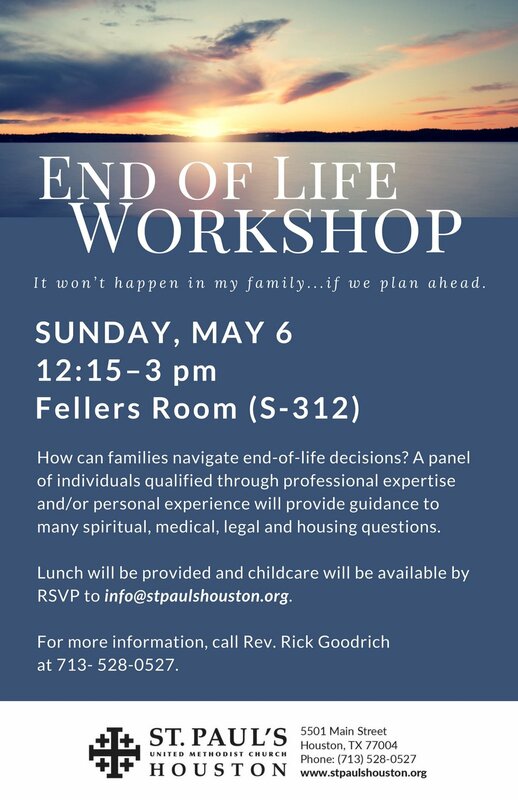 The St. Paul’s Foundation and Congregational Care team will co-sponsor a workshop on Sunday, May 6, about how to start a family conversation about the many crucial decisions surrounding death, a conversation that invites each family member to voice personal wishes concerning these decisions. The workshop will be Sunday, May 6, from 12:15 to 3 p.m. in the Fellers Room (S-312). Lunch will be provided, and childcare will be available. For more information about the workshop or End of Life concerns, stop by the Plaza on Sunday mornings, starting April 8, or contact Rev. Goodrich via rgoodrich@stpaulshouston.org, or the Foundation via foundation@stpaulshouston.org, or the church at 713-528-0527.